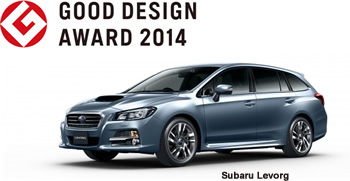 Tokyo, October 1, 2014 - Fuji Heavy Industries Ltd. (FHI), the manufacturer of Subaru automobiles, is pleased to announce that the Subaru Levorg has won the "Good Design Award 2014" from Japan Institute of Design Promotion (JDP). "True to its product concept as the fusion of sports car and wagon features, the Subaru Levorg has a dynamic form with fender blisters and a roof line that's sloped more sharply than the traditional wagon-style Legacy while maintaining the brand's strengths of good visibility and a versatile cargo space. On the interior, for which Subaru has gone so far as to set up a special working group to complete finishing touches, we can see the attention that they've given to details in the feel of materials and the sound quality of moving parts. With further advances made on the brand's unique technologies such as the horizontally-opposed engine and EyeSight driver assist system, the Levorg has been completed as a vehicle that ensures a secure, enjoyable driving experience." Following the 2013 award given for the Forester and 2012 award for the Impreza and Subaru XV, this marks the 3rd consecutive year that Subaru has been honored with the Good Design Award, which reflects JDP's high praise for the Subaru design that fuses together style and functionality.